Lal-DeD lived in Kashmir in the 14th century, where many streams were merging and influencing the surrounding cultures; Shaivism, Sufism, Vedantic non-dualism. There are no written references about her until about four centuries after her death, and legends of her life were preserved in the oral tradition until the 1800’s. The word ‘Lalla’ means ‘darling’ in Kashmiri, a testimony to how deeply loved she has always been. 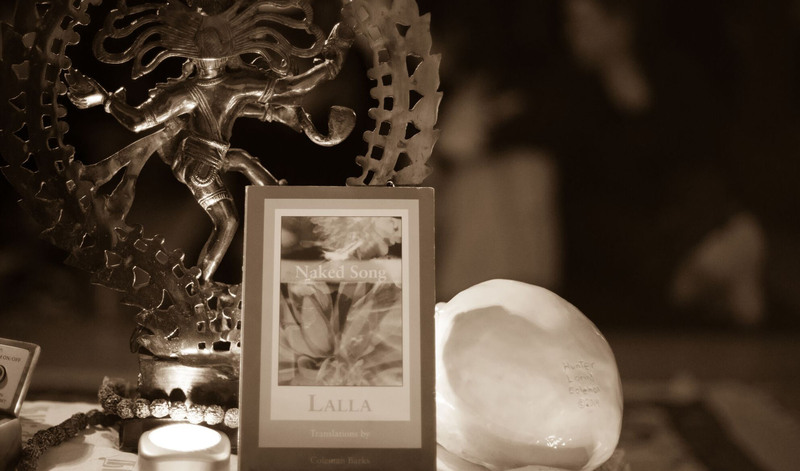 Born in Kashmir sometime around 1320 to a Brahman family, Lalla was even from a young age a spiritual seeker. Married off at age 12 as was the custom, there are stories of her being treated cruelly, beaten, and practically starved, as a young wife living with her in-laws, though she never complained. She loved to spend time meditating at shrines and often stopped there as they went about their chores. One time it was said her husband was angry at her dawdling and struck the water jug she held on her head. The jug shattered, but the water remained in the shape of the jug above her head. This water became what would be known as “Lalla’s Lake” in Kashmir. She eventually renounced her home and family, left at age twenty-four and went to study with the great Tantric teacher Sed Bayu. She began to follow unconventional expressions of devotion, wearing no clothing as a symbolic expression of the stripped down Truth of her heart. A story is told that one day, when wandering naked, some townspeople jeered. She asked the cloth seller for two pieces of cloth of equal weight which she put over each shoulder. When met with RESPECT or SCORN she would tie knots on one side or there other. At the end of the day she came back to the merchant and asked him to weigh the cloth. The scales swung in balance, of course, no matter how the cloths were knotted. PRAISE and BLAME have no substance or weight of their own. Lalla sang her beloved verses, known as vakhs, as she wandered the streets of Kashmir most likely until her death around age 80. They are still sung by many to this day. Lalla's words are songs of awareness, of the knowing that there is no difference between the individual Self and the Universal Self; the purpose of human life is to realize this. She speaks of the Divine with many names: God, Goddess, Shiva Shakti, You, I, Lalla, That, or My Lord. Lalla’s words are full of feminine symbolism and sensual touches: Moons, lakes, nectar, waterfalls, a nursing child, making love in a jasmine garden. Her poems are a celebration of having merged with the Divine within, and the freedom experienced from that knowing.